This 8 inch Wendy is here to wish you a Happy Chanukah! She is a is a darling, fully articulated vinyl doll with green eyes and center-parted brunette curls tied back with gold ribbon. 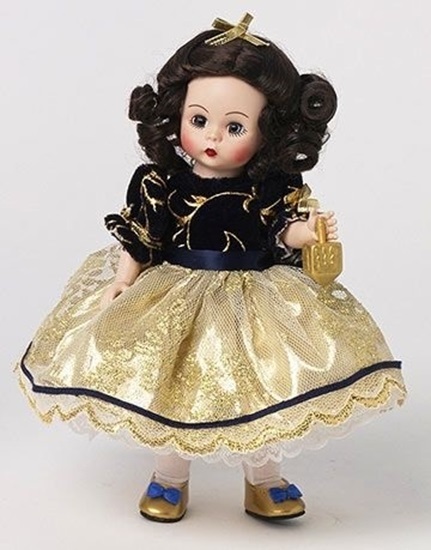 Her full-skirted dress has a navy flock bodice embellished with a metallic gold embossed pattern and short puff sleeves with ruffles and bows. The skirt of her dress is metallic gold lace trimmed with lace and navy soutache. An underskirt of gold lame is worn over a white lace-trimmed taffeta petticoat and white tights. Metallic gold flats with blue bows complete her sweet holiday look. This holiday doll comes with her own dreidel that spins! Suitable for ages 14 and up.